This page is about a near earth crossing asteroid. It is about 400 m in diameter and will pass about 324,605 km (201,700 miles) from Earth's surface (this is between 50 and 51 Earth radi). Although it is very unlikely that this will hit the Earth this time (November 11th, 2011) as predicting orbital trajectories is just Kepler's law, it may hit on a later pass. It's semi-major axis is about 1.06 A.U. and its period is about 1.10 years. This orbit takes it inside Venus' at perihelion and out to Mars' aphelion. Due to perturbations of the planets, the orbit will deviate slightly from Kepler's law over time. That is becasue this is not really a two body problem anymore. 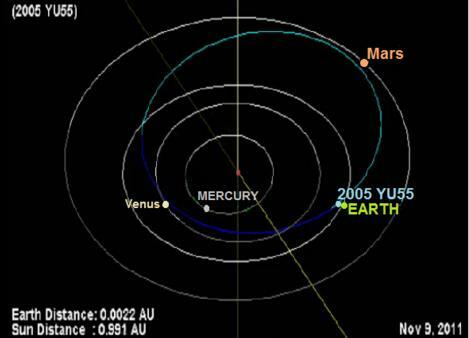 If this asteroid were to hit Earth, the size of the impact crater would be about 4.4 km. See below for work. A Purdue simulation yields a transient crater diameter of 3.7 km and a final crater diameter of 4.41 km (I'm going to apply to Purdue for their Physics Doctoral Program). The orbit is shown below (image taken from a page that I co-authored at ArkCode.com). Damage from such an impact would be severe along coastal areas if it hit the ocean or effect a few states if it hit land in the US. It does not have the potential to destroy civilization, but it could be a city killer. The relevant courses used to come to this conclusion at Embry-Riddle Aeronautical University are EP393 (Spaceflight Dynamics) and EP420 (Planetary Science).